I've been knitting for two years now, and although I try and set myself new challenges, they're never ones that really stretch my skills as a knitter. So, this year, 2013, I thought I would set myself a big challenge. You all know how much I detest cardigan knitting. I've tried to cure this over the years by knitting both seamed and seamless cardigans, but I still hate making them. I'm not very good at sewing up, or picking up stitches for collars or button bands, so I thought doing a cardigan themed challenge would really stretch my knitting abilities. In no particular order, here is the Year of the Cardigan project list! For Daisy: This raglan lace cardigan will be for my youngest niece, Daisy. The pattern I have chosen is 'Helena by Alison Green Will.' The yarn I will use is Peter Pan DK by Wendy, in Purple (3003), and I will use up to 4 skeins of yarn as I am knitting the 2 years size. 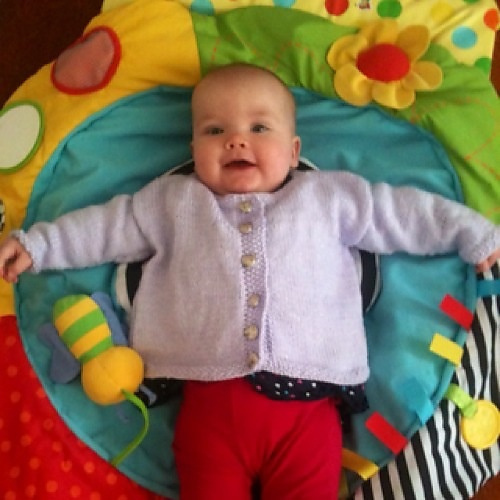 For Tilly: This seamed cable cardigan is for my eldest niece, Tilly. I am making Tilly the 'Hallows Cardigan by Melissa Metzbower.' The pattern does look more of a guy knit, but I have seen others knit it in pinks and it looks very feminine! I decided to knit it with Stylecraft Special Aran in Fondant (1241), and I would use 4 skeins as I am knitting the 6/8 years size. For Molly: Like me, my best friend Molly loves 1950s style clothes so I decided to make her 'Peggy Sue by Linda Wilgus'. Molly looks gorgeous in dark purple, so I am using Stylecraft Special DK in Emperor (1425), and I would use 3 skeins as I am knitting the Medium size. For Me: My cardigan is going to be 'The Inspired Cardigan by MayaB', as I am really into retro knits! One of my best colours to wear is red, so I will be using King Cole Pricewise DK in Red (009). I'm not sure on the quantities I need until I purchase the pattern. For Abby: For my best friend Abby, I'll be making 'Julissa by Vanessa Smith'. It'll be my first jumper, so I'm looking forward to knitting it. Abby looks fab in dusty/pale pink, so I chose to use James C. Brett Top Value DK in 22 colourway (it's a pale pink). I think I'll need about 5 or 6 skeins. Knit 5: Don't know what to make, or who to make it for yet! I'm really looking forward to this big challenge, even if I still hate cardigan knitting by the end of the year, I will have gained more skill at making them. You can check out the blog page for updates on how the challenge is coming along. Have you set yourself a big challenge for 2013?